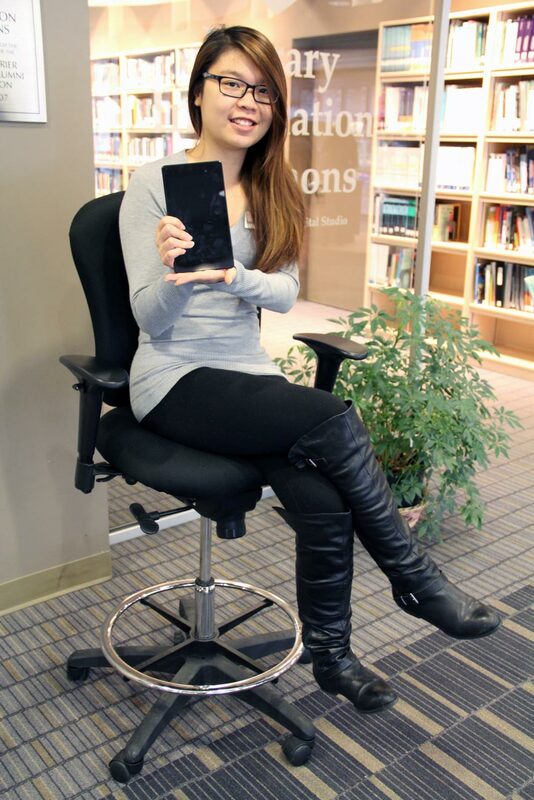 In a new pilot program, a team of student Library assistants, armed with seven-inch Android tablets, will be on the move in Laurier’s Waterloo campus Library. The roving student assistants can help users with tasks such as using the self-checkout machines and finding reserve and hold items, and will also monitor noise levels in various locations. The current weekly schedule is for one of six student assistants to be on duty from 1 p.m. to 10 p.m. Monday to Thursday and from 1 p.m. to 4:30 p.m. on Friday. When not helping an individual user, the on-duty assistant will be stationed on the main floor between the Services and Help Desk and self-checkout machines – look for their Library nametag, and if you have a question, let them know! The new program is one of a number of new public services we have recently added to help the Laurier community use the Library more efficiently and effectively. For more information on broader recent changes to public services at the Library, visit http://library.wlu.ca/upgrades.